With Arctic, Brazilian director Joe Penna’s debut feature offers audiences a conventional survival thriller of one man pitted against nature, which still manages to deliver the occasional moment of raw tension. Mads Mikkelsen stars as Overgård, a Danish explorer who is forced to crash-land his aircraft in the middle of the arctic tundra. He strips all available equipment from his shattered plane but, despite his best efforts, the barren landscape offers little hope of salvation. Yet Overgård perseveres, living by alarms set on his wristwatch that alert him when to carry out the next duty of the day. As is often the way with such films, much of the pleasure is derived from the ingenuity of Mikkelsen’s character, be it a fishing line rigged with rattling alarms or the construction of makeshift sledges from plane doors. Penna, who rose to fame as a YouTube filmmaker, co-writes the screenplay with fellow newcomer Ryan Morrison. Dialogue is near to non-existent, echoing J.C. Chandor’s superior All Is Lost. Penna’s seeming familiarity with the survival genre has been put to good use, structuring the film to hit the right beats at the right times, regularly providing gasp-inducing moments. Early on in the film, we are led to believe that Mikkelsen’s character might be promptly rescued, only to watch a helicopter crash during a snowstorm. Rather than being saved, he turns into the rescuer, dragging a young female pilot (Maria Thelma Smáradóttir) from the debris – another life in his hands. Penna does push the boundaries of credulity at times, with one scene in particular (involving a polar bear) feeling like a big budget advert for Glacier Mints – with added mild peril. In his attempts to build tension, he pushes the situation slightly too far, frustrating for a film that demonstrates a clear, workmanlike ability to satisfy generic convention. Penna is better when utilising the landscape to his advantage, with the barren tundra allowed to speak for itself thanks to the work of cinematographer Tómas Örn Tómasson. 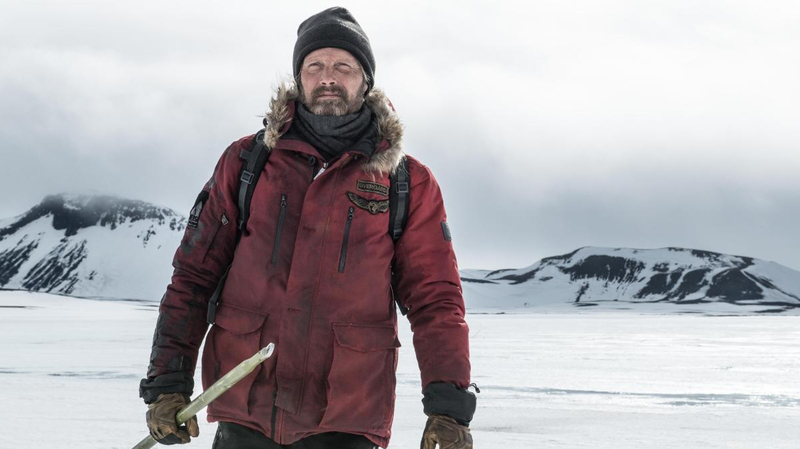 Far from breaking the mould of the survival drama genre, Arctic nonetheless offers thrilling moments and entertains throughout, mainly thanks to Mikkelsen’s muscular performance as the grizzled Overgård. Penna undoubtedly has talent and, with Arctic, displays enough directorial verve to have us interested in what he attempts next.